This remarkable and innovative new book shows that leadership is far more than just a title; it is a way of living. What distinguishes successful, influential, and confident leaders from the rest? The answer is Higher Living Leadership. Dr. Melodye Hilton has developed and packaged scientifically based concepts and principles that transform the leader and their leadership application from the inside-out. 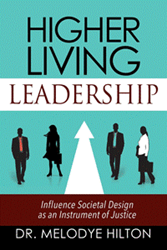 Outskirts Press, Inc., has published Higher Living Leadership: Influence Societal Design as an Instrument of Justice, by Leadership Consultant, Certified Behavioral Analyst, and Executive Team and Personal Coach, Dr. Melodye Hilton. Through years of experience in training and consulting leaders of various spheres of influence, Dr. Melodye Hilton has developed and packaged scientifically based concepts and principles that transform the leader and their leadership application from the inside-out. Presented for immediate, practical application, individuals are guided to discover their validation quotient—the attributes that unleash personal leadership value, generate it in others, and positively transform culture. Whether leading a small family or an entire nation, this values-driven content can revolutionize the way leaders view and apply leadership. In this book, Dr. Hilton reveals the practical steps to: Discover personal purpose that drives decisions and determines impact, discover and operate out of intrinsic value and be empowered to recognize it in others, recognize the effects your thoughts and choices have on the brain, body, and the fulfillment of purpose, employ Higher Thinking through continued development of the mind, purposeful choice, and values-driven self-management; and become an authentic leader who establishes trust naturally. “In Higher Living Leadership, Dr. Hilton invites tomorrow’s leader to think differently. Her invitation is not based on idealistic theory and philosophy, but rather, is inspired by, and rooted in real science, yet speaks to true heart of leadership and human potential.” Peter Demarest, Co-Founder, Axiogenics, LLC, and Co-Author, Answering the Central Question. Deftly constructed at 211 pages, Higher Living Leadership: Influence Societal Design as an Instrument of Justice is being aggressively promoted to appropriate markets with a focus on the business & economics / workplace culture category. With U.S. wholesale distribution through Ingram and Baker & Taylor, and pervasive online availability through Amazon, Barnes & Noble, iBooks, and elsewhere, Higher Living Leadership meets consumer demand through both retail and library markets with a suggested retail price of $14.95, print, and $9.98, electronic. Dr. Melodye Hilton works with individuals as well as workgroups around the globe as a Leadership Consultant, Certified Behavioral Consultant, and Executive Team and Personal Coach. Through years of leadership experience and consulting, she has developed a unique and personal approach to creating a positive, sustainable impact within her spheres of influence.